On An Overgrown Path: How did something so promising go so wrong? How did something so promising go so wrong? Since 1995 - the last time I produced a movie (To Die For) - the digital distribution of most popular forms of art has reinforced the popularity of a small group of artists and cast almost all others into shadow. To be a young musician, filmmaker, or journalist today is to seriously contemplate the prospect of entering a profession that the digital age has eroded beyond recognition. The deeper you delve into the reason artists are struggling in the digital age, the more you see that Internet monopolies are at the heart of the problem and that it is no longer a problem just for artists. That quote comers from Move Fast and Break Things: How Facebook, Google, and Amazon Cornered Culture ... by Jonathan Taplin. Its title comes from the Mark Zuckerberg quote "Move fast and break things. Unless you are breaking stuff, you aren't moving fast enough". In his book Jonathan Taplin points out that the five largest firms in the world measured by market capitalisation are Apple, Google/Alphabet, Microsoft, Amazon and Facebook, and goes on to ask about the Internet "How did something so promising go so wrong?" 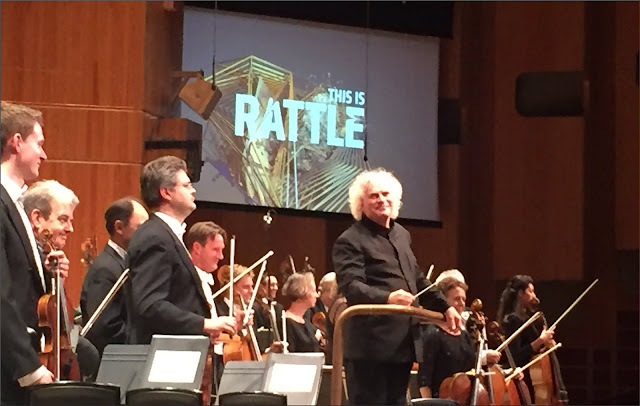 Back on digital planet earth the London Symphony Orchestra's concerts with Simon Rattle are available without payment live - i.e. in real time - and on demand for 90 days on YouTube and live on Facebook. As Jonathan Taplin explains, YouTube is the largest music streaming site in the world, with a 52 percent market share, but it generates only 13 percent of streaming revenues. He goes on to point out that more people than ever are listening to music, reading books, and watching movies, but the revenue flowing to the creators of the content - i.e. musicians etc - is decreasing while the revenue flowing to the big four platforms - YouTube, Facebook, Google and Amazon - is increasing. Are those who are trumpeting that "the biggest threat facing musicians and their work is Brexit" living on the same digital planet as the rest of us? There may be a considerable delay in moderating comments for this and other posts as, not coincincidentally, I am off-grid for an extended period. In a Facebook comment Caroline Rae says " I wonder what the MU has to say about the free access availability of the LSO concerts on the web? Presumably this has all been negotiated with the MU?"